Guppies have a really simple lifecycle. In this article you will find the different growth stages of guppies. I will tell you how to care for your fish in the different stages in order to grow big, colorful and healthy guppies. If you follow my advice, you will be able to get your guppies at full size in 2-3 months. Guppies are livebearer fish; they do not lay egg, so the larval stage is missing completely. The male guppy fertilizes the female. The baby guppies will develop inside the female’s body for about 30 days, until they are born. Guppy fry are free swimming right from the start. Once they are born, the first thing they do is to look for a place to hide. They are deformed at the beginning, but after couple of hours their body straitens and become strong enough to start feeding. Guppy fry are small; they are about 1/4 inch (0.6 mm) in length. Most of the time adult guppies and bigger fish will eat them. To save your fry, you might want to separate the pregnant guppy female from the rest of the fish, or provide enough hiding spaces, such as live plants, to your fry. Guppy fry will eat the same food as their parents. However when you feed flake foods to them, make sure you crush it up into powder. Feeding live food is also beneficial to your guppy fry. Baby brine shrimp are the best food you can give them. The yolk of a hard-boiled egg will also help significantly in their growth. Leaving the light on for 12-16 hours a day for fry can also contribute a lot to their growth. Frequent water changes are a must, especially if you feed your fry multiple times a day. Some guppy breeders do complete water changes every day or every other day. At about one month, guppy fry become juvenile. In the juvenile stage, they start gaining some color and you can distinguish the different sexes. Females are much larger and their gravid spot are already visible, while the tale of males are smaller and start coloring up. The gonopodium of male guppies start forming. The juvenile stage is one of the most important in the life of a guppy. It is important to give them the best food and water. At this stage you can feed brine shrimp, blood worms, high quality flakes, spirulina and plankton pellets and beef hart. Guppies in the juvenile stage are between 1/4 and 3/4 inches (1.2 to 2 cm) in length. At around 2 months they start maturing sexually and they become young guppy. Young guppies start being sexually active at around 2 months old. 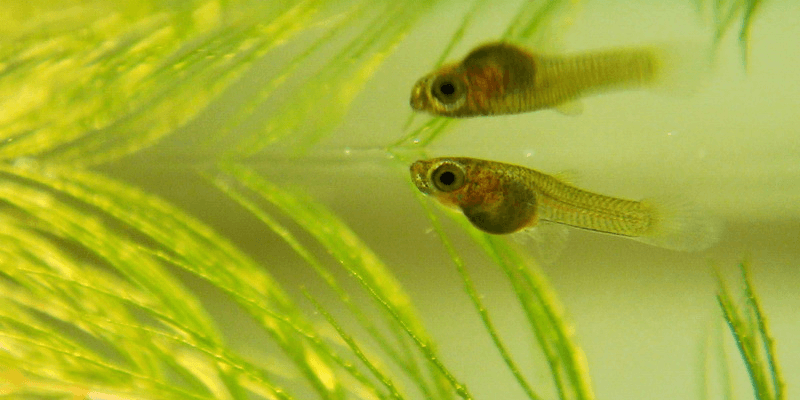 Selective guppy breeders separate the males from the females in the juvenile stage. Keeping the males separated from the females will also contribute to their growth, because they are only focusing and feeding and not reproduction. Feeding young guppies is a bit different than feeding guppy fry. You want to lower the fat intake and offer them more protein and greens. Brine shrimp should be still their main source of food. Spirulina and plankton pallets will help develop a more intense color. At around 6 months old, guppies become adults. At around 6 months, guppies reach their adult stage. Depending on their genetics, and conditions an adult female guppy can reach about 1.5-2 inches (4-6 cm). Their growth will stop or slow down significantly. The fins and tail of male guppies might grow longer over time, depending on their genes. To keep your guppies healthy and colorful, you should still feed them a variety of food. Their main food should be flake food high in protein. Avoid feeding them fats, because it is bad for their health. Guppies can live around 2-5 years. At around 1.5-2 years old adult guppies become infertile and they are not able to reproduce anymore. Now that you know about the different guppy growth stages, and know how to feed the fry, juvenile and adult fish, go ahead and start breeding guppies. If you might have any questions, please ask me in the comments below. Also check out my other articles to learn more about guppy fish. Next post How to Prepare Your Guppy Aquarium for Vacation? Previous post Best Food for Guppy Fish – How to Feed Your Guppies? Hi how long do you keep baby guppies in a mesh box for. Hi Darrel. I recommend keeping baby guppies in a breeding or mesh box for up to one week. It would be ideal if you could separate the babies to a new tank, where they can grow. If you don’t have the possibility to run multiple fish tanks, you can release the babies into the main tank after one week, but provide them with hiding space. Add live plants, such as Java moss or Guppy grass so the fry can hide and be safe. Before you release the baby guppies into the tank, feed the parents well, so they will not go after the fry. Release all the fry at once, to lower the changes of the parents are eating them. If you have a community tank with angelfish or goldfish, you might not want to keep the babies until they get bigger. Angelfish will eat the small babies no matter you feed them or not. Goldfish have a huge mouth, so they are also a danger for the fry. Yes, you can keep guppy fry together with other small fishes, just make sure you provide them with enough cover and hiding spaces through aquarium plants.